Sunday's show raised a few eyebrows when the Noel-penned hit Wonderwall was performed by his sibling Liam - with whom he had a major falling-out - and the rest of his former Oasis bandmates, who now record as Beady Eye. It prompted many to wonder why Noel, whose post-Oasis career has been more successful than his brother's, hadn't been involved in the show. But in an interview for XFM, he said he had been approached but was unhappy with the secrecy and miming at a gig for tens of thousands of people. "I was asked to do it a long time ago and, to be frank, they were being so secretive about it," Noel said. "I was like 'Who else is playing?' and they were like 'We can't tell you, you've got to sign a confidentiality agreement'. It's like it's the Iran nuclear programme or something. "And then they wanted me to do it acoustically - and then they wanted me to mime. And I'm all for miming in TV shows - but if you're in a stadium with 80,000 people and you're pretending? I can play live! I said (to one of the organisers) 'Why do you want me to mime?' and he said 'It's a big gig'. Really? I do this s*** for a living. "In the end, I was just like, you know what, I'd rather watch it on the telly." 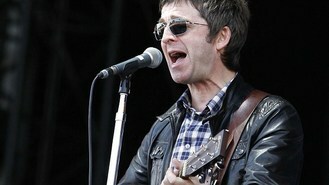 Noel, who jokingly referred to Beady Eye as "Stratford's finest Oasis tribute band" during a gig, made his comments ahead of an intimate show he performed for the station and told presenter Danny Wallace that he waited until late on Friday to give his approval for Beady Eye's version.